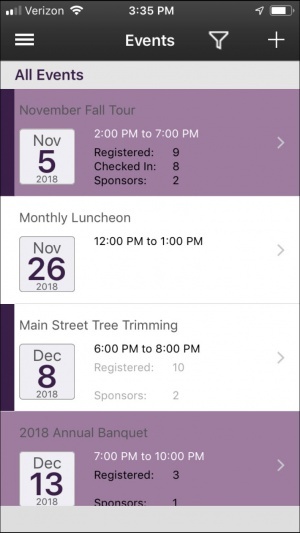 The ChamberMaster/MemberZone Mobile App Suite features convenient mobile applications developed for your staff and your members. All of the apps were designed with one common goal in mind – to help your organization engage anywhere, anytime from any device. 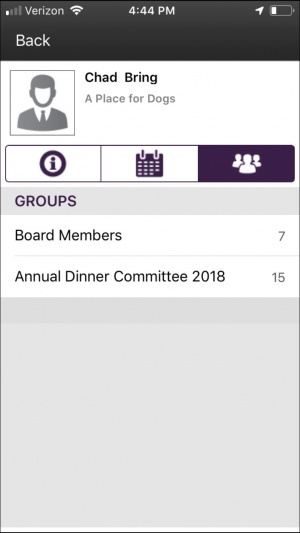 The mobile companion for ChamberMaster and MemberZone users that provides real-time membership information no matter where you are. 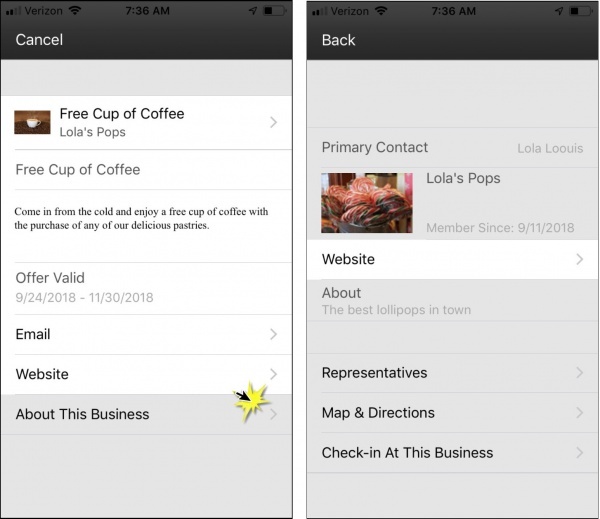 The Staff App helps make your member visits more substantive and meaningful – you can see at a glance if they’re signed up for your upcoming event or when you last sent leads their way. 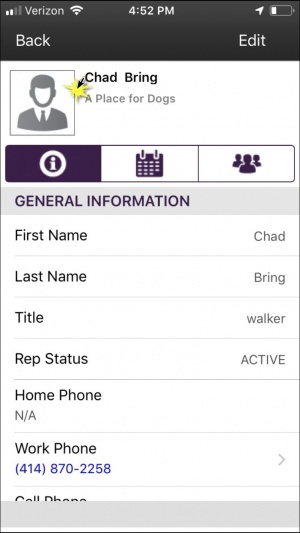 The Staff App is for your staff to use while on the road. It does not replace the full product – rather it is a companion product giving your team access to information when remote. 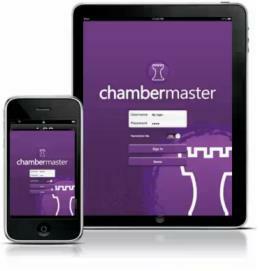 Apps are downloaded to your smartphone and can access certain aspects of your ChamberMaster/MemberZone database. Available for iOS and Google Play Store devices. ChamberMaster and GrowthZone users can download the app for staff, log in using their current credentials, and begin using it immediately. Android requirements: Android v 2.2 or later. iOS requirements: iPad, iPhone App. Compatible with iPhone 3GS, iPhone 4, iPhone 4S, iPhone 5, iPod touch (3rd generation), iPod touch (4th generation), iPod touch (5th generation) and iPad. Requires iOS 6.0 or later. 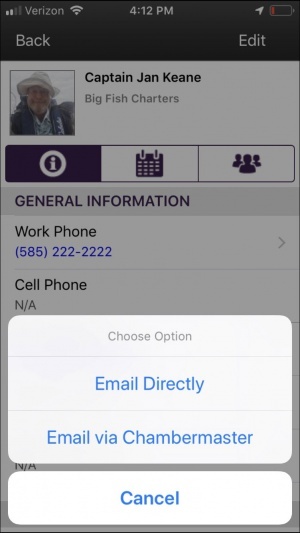 Encourage everyone in the office to download the app –it’s free and integrated with your member management software! Upgrade to the premium edition of the Staff App. The rate is just $20 per month for your entire staff to use on unlimited devices! Additional time-saving features are available with the premium edition. Note: The Premium edition of the app is included with Plus, Premier or Pro software editions when purchased or upgraded after the first quarter of 2014. From the back-office, click Account in the left-hand navigation panel. 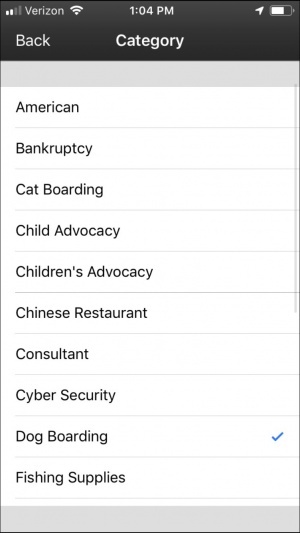 Select the Mobile Application tab. Click the check-box adjacent to Upgrade my mobile plan to include the premium features. I agree to have an additional $20 added to our monthly bill. If invoiced annually, the chamber will be billed a pro-rated amount. Upon annual renewal, the chamber will be invoiced for the full annual fee. NOTE: If the Premium Edition is already enabled, Premium Mobile Features: Enabled will be displayed on the Mobile Application tab. Click Upgrade. Immediately you will have premium features added to all Android and iOS apps downloaded by your entire staff. One upgrade includes unlimited devices on all platforms for your entire staff. NOTE: At times, after an upgrade to the Premium Edition, the app does not switch. 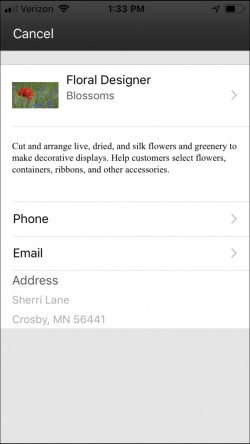 In this case, within the App, click Settings in the left-hand navigation panel and select Clear Cached Data. Log-out of the app and log back in. If this does not work contact support@growthzone.com. 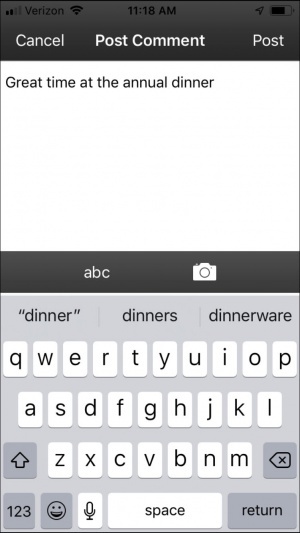 Click the App icon on your phone. Enter Username and Password. These are the same credentials used to access the database. 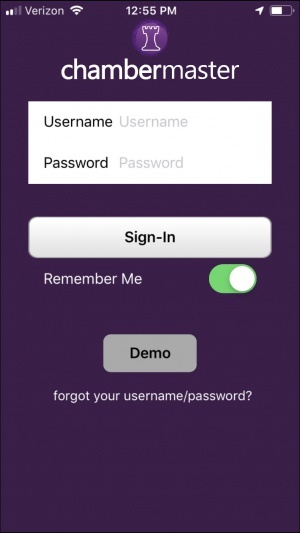 NOTE: The Remember Me slider is enabled by default, so once you have logged, you will remain logged in until you manually log-out. If you do not wish to remain logged in, move the slider to the right. Click forgot your username/password to be sent an email with instructions on resetting your username and/or password. The Staff App Dashboard provides an at a glance view of your database. Memberships: The Memberships section will display the number of Active & Courtesy members. Clicking into the number will open the directory and display those members. Membership Activity: This section will display new member and dropped member statistics. Clicking into the number will open the directory and display those members. Events: In the events section you will see the number of events for the current week/month (click on the number to view the actual events) and year to date revenue statistics. 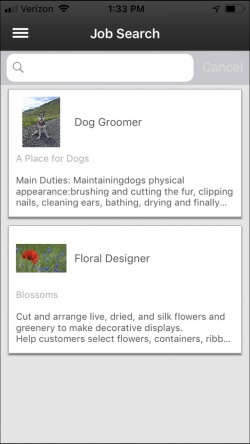 Tasks: In the tasks area, you will see the number of tasks that may require attention. 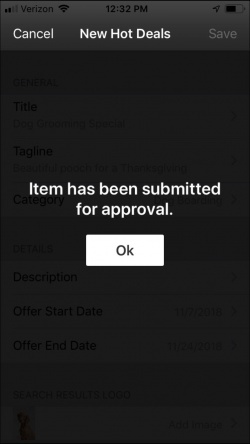 This area will display a list of any tasks (member applications to approve, hot deals to approve, marketspace items to approve, events submitted by your members to approve, and reminders). NOTE: Premium Version of the Staff App is required to approve tasks. Click Here to learn how to upgrade to the Premium Version, and start taking advantage of additional features. Anniversaries: This section will display the number of your members who have join anniversaries in the current month. NOTE: Premium Version of the Staff App is required to view anniversaries. Click Here to learn how to upgrade to the Premium Version, and start taking advantage of additional features. Using the Staff App Dashboard (described above), you can navigate to various functions within the Staff App. Additionally, a navigation panel is displayed by clicking the in the header. 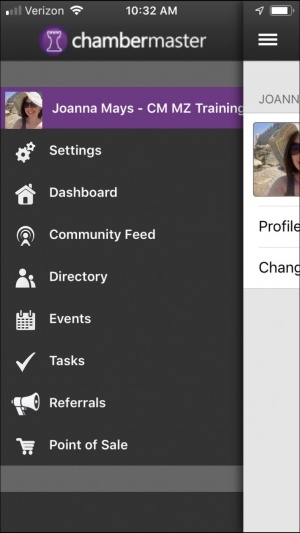 You, as a staff member, logged into the Staff App may update your profile, including adding a photo. Profile modifications will be reflected in the database, under Setup > Chamber/Association Employees/Reps. In addition, those of you who have enabled Member Information Center version 4 will have the option to view/edit personal profile information by clicking the MIC button in the upper right-hand toolbar when logged into the back office software. 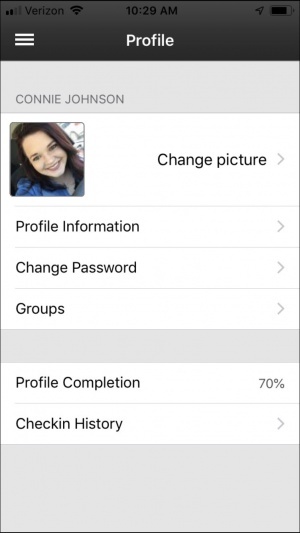 When adding a profile photo via the Staff App, the photo will be displayed in the MIC and in the Staff App. 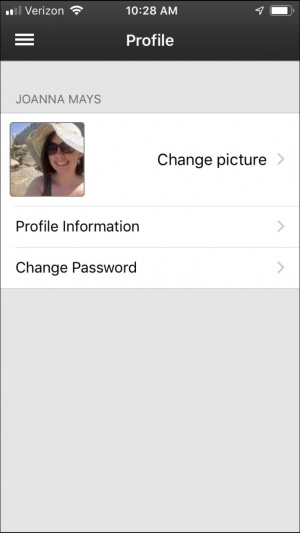 When adding a profile photo via the Staff App, the photo will be displayed in the MIC and in the Staff App. Clicking the in the header. Click your name in the left-hand navigation panel. 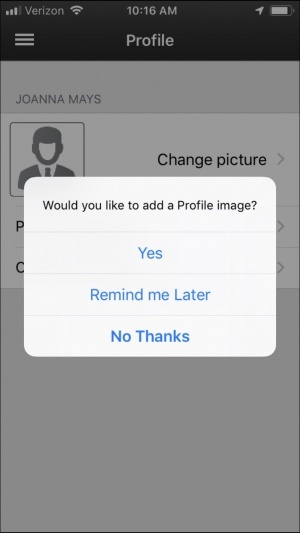 If you do not have a profile image, the Would you like to add a profile image? screen will be displayed. Click Yes to add your profile image. Click Use Camera to take a picture. 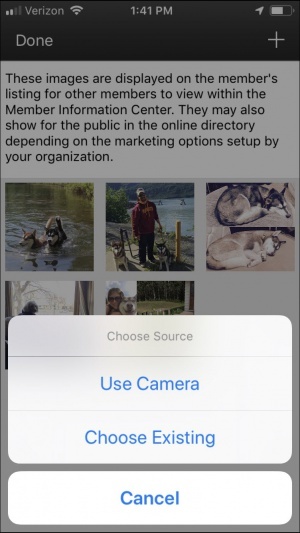 OR, click Choose Existing to choose a photo from the photos on your device. Click the in the header. 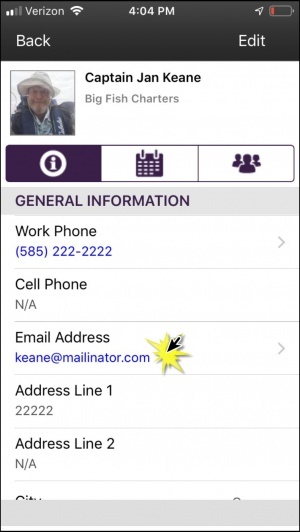 Using the Staff App, you can update your personal profile information (name, phone number, email,etc.). This information will then be updated in the database, and viewable in Setup > Association Employees/Reps and in the MIC. Make desired changes, and click Save. 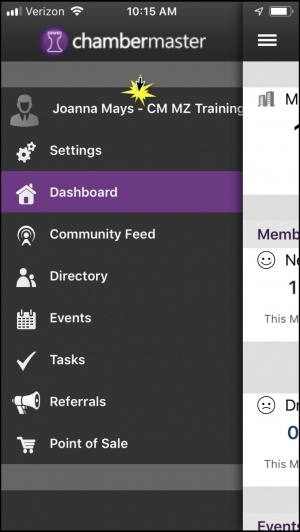 The Community Feed in the Staff App is a great way to stay in touch with your members while you are on the go, a great way to keep them engaged. The Community Feed is the feed that is available in the Info Hub. 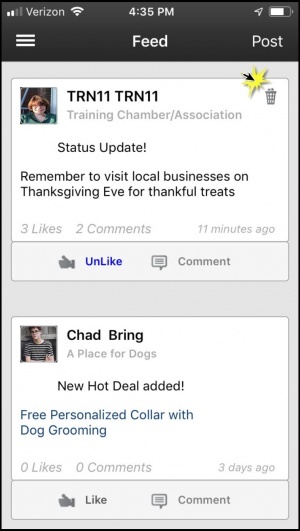 You will be able to see hot deals, jobs, comments made by your members and be able to add comments as well. The posts you add using the Staff App will automatically be displayed in the Info Hub as well. 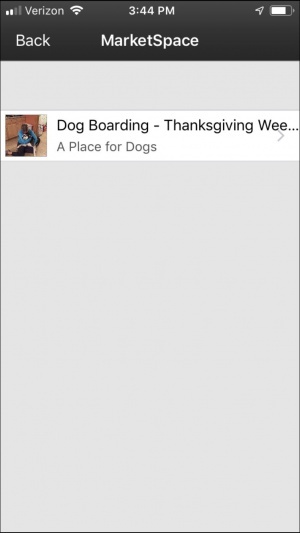 In the left-hand navigation, click Community Feed. The Community feed will display the most recent comments first. You and your members have the ability to add posts to the feed, like items, and comment on items. Click on a post to view further details, comments, and to add comments. Click the icon to like a post. Click the to add a comment to a post. Enter comments, and click Post. Click on a post to view further details. Click the to add a comment to a post. Click the icon to like the post. Enter desired text for your post. 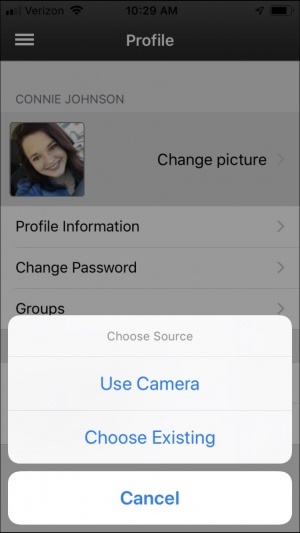 (Optional) Click the icon to take a picture to add to the post, or select an existing picture from your albums. Click the icon for the post you wish to delete. NOTE: You may only delete posts that you have entered. Your post is now deleted. 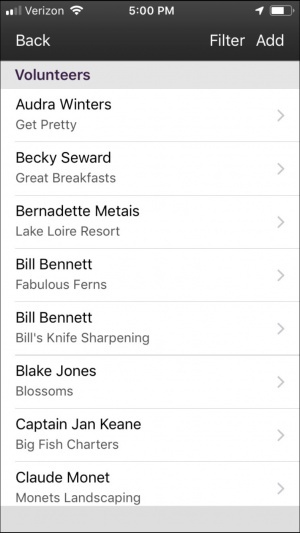 NOTE: The items marked by an asterisk are available in the Premium Staff App. 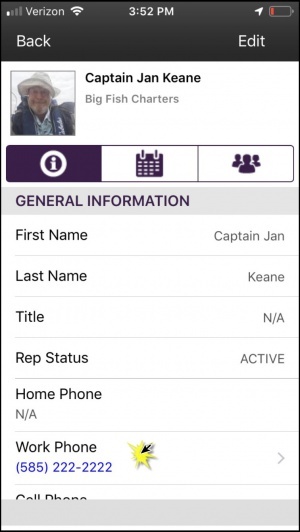 NOTE: Premium Version of the Staff App is required to add members using the Staff App. Click Here to learn how to upgrade to the Premium Version, and start taking advantage of additional features. Click Directory in the left-hand panel. A list of your members will be displayed in alphabetical order. Click the + in the header. Type: Click the > to view a list of your membership types to assign this member to. Status: Click the > to assign the member to the appropriate status. NOTE: Alternately, you may select Go to online application. This option is best used when you wish to assign fee items to the membership purchase, as well as gather custom field information, sell additional items, etc. The Directory list is color coded. Active members are displayed in Black, Courtesy members are displayed in Blue , Dropped/Inactive members are displayed in Red , Prospective members are displayed in Green and Non-Members are displayed in Grey . Type the name of the member into the search box, or simply scroll through the list to find the member. OR click the icon to apply additional filtering options. 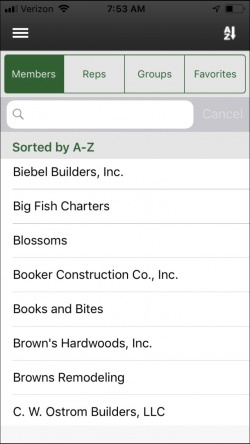 Click Alphabetical (A-Z) to sort the list of contacts alphabetically. NOTE: Membership Status filters will be applied. 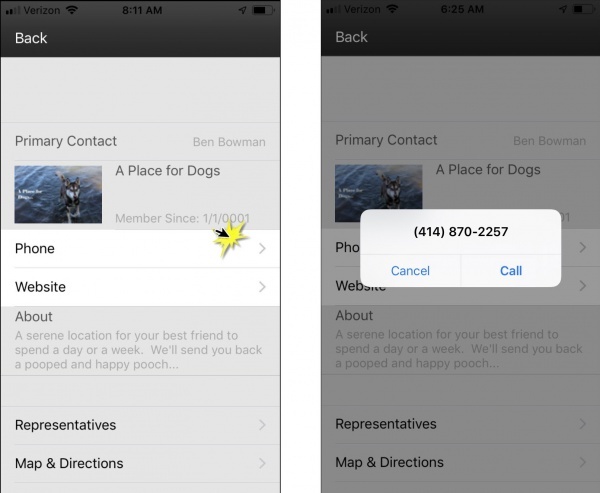 Click Distance to sort contact based on how close the member is to your current location. Distance is measured from the device location (not your office). The GPS feature in the device must be enabled for the distance to display. NOTE: Membership Status filters will be applied. Click Category to filter members to a specific category, then select the desired category. NOTE: Membership Status filters will NOT be applied. 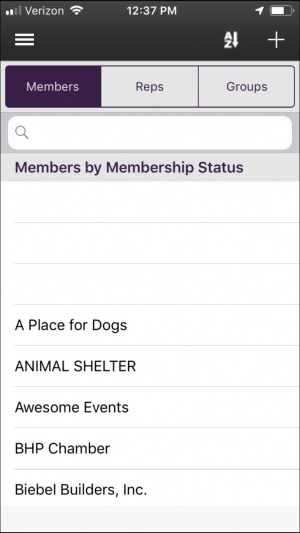 Click New Members This Month to filter to just those members who joined in the current month. NOTE: Membership Status filters will NOT be applied. 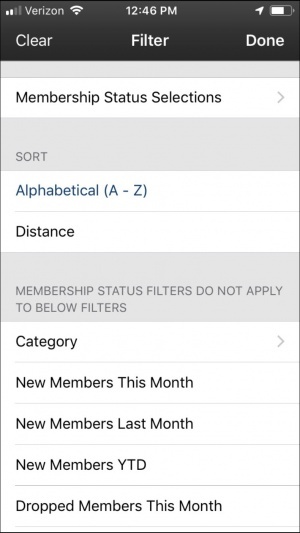 Click New Members Last Month to filter to just those members who joined in the previous month. NOTE: Membership Status filters will NOT be applied. Click New Members YTD to view just those members who joined in the current year. NOTE: Membership Status filters will NOT be applied. Click Dropped Members This Month to view just those members who dropped in the current month. NOTE: Membership Status filters will NOT be applied. NOTE: To clear filter, click the icon and click Clear. Click the name of the member in the list. General Information - this tab includes the general information displayed in the database on the general tab. It will include address, phone, email information, comments & categories. 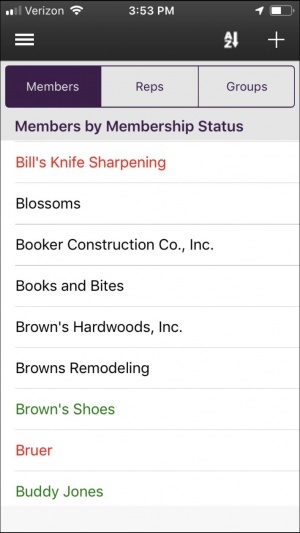 Information - this tab will display the status, membership type, and renewal month for the member. In addition, it will display any current balance along with total recurring fees. Statistics - this tab will display statistics (web leads, events, web benefits) as displayed on the statistics tab in the back office. 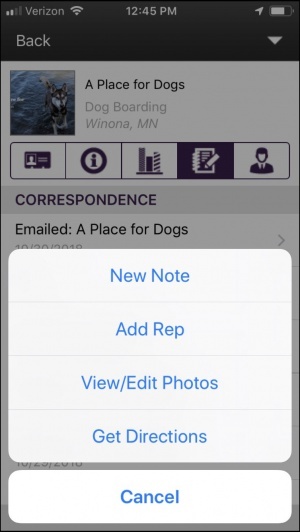 Correspondance - this tab will display any emails, or notes that have been logged for this member, as on the communications tab in the back office. 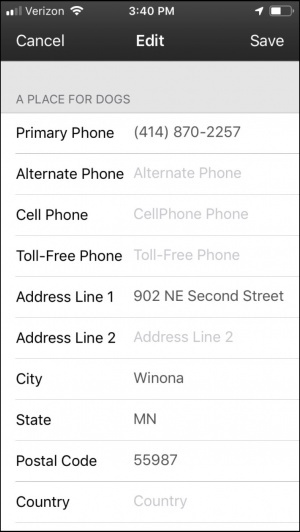 This will also display any phone calls you have made to the member from the app. Reps - this tab will display the reps associated to this member. 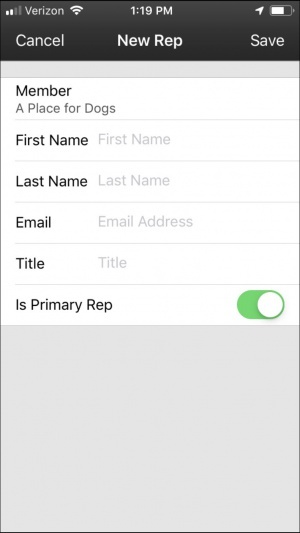 Clicking into the name of a rep will open the reps details page. Click into and edit the field you wish to change. Changes made through the Staff App will automatically be reflected in the back office. 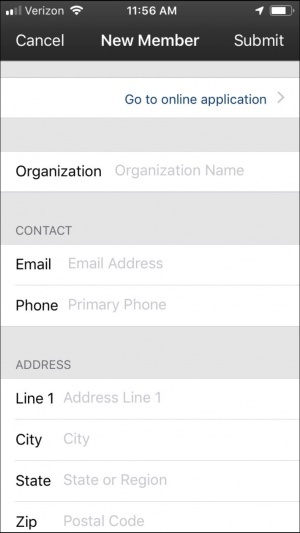 NOTE: Premium Version of the Staff App is required to make calls using the Staff App. Click Here to learn how to upgrade to the Premium Version, and start taking advantage of additional features. Click Directory in the left-hand panel. A list of your members will be displayed in alphabetical order. 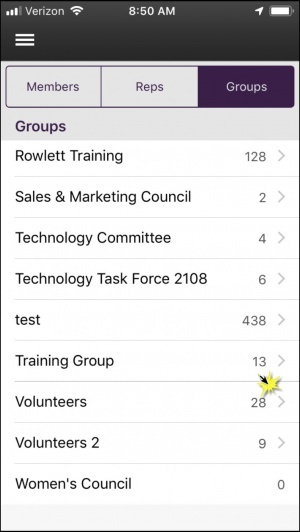 See View/Search the Member Directory with the Staff App for information on filtering your list of members. In the directory list, click the name of the member that you wish to call. 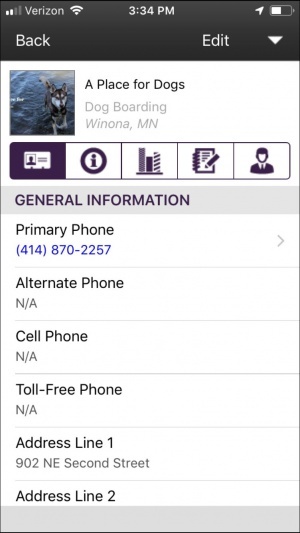 On the General Information tab, click the phone number that you wish to call. NOTE: Your call will be logged on the member's Communication tab, both in the App and in the back-office! 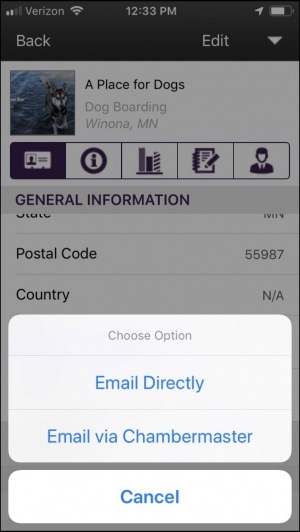 NOTE: Premium Version of the Staff App is required to email a member using the Staff App. Click Here to learn how to upgrade to the Premium Version, and start taking advantage of additional features. Click the name of the member to whom you wish to send an in the list. On the General Information tab, click the member's email address. Email Directly: If this option is selected, the email will not be logged on the members' communication history tab. Email via ChamberMaster: If this option is selected, the email will be logged on the member's communication history tab. Compose and send your email. 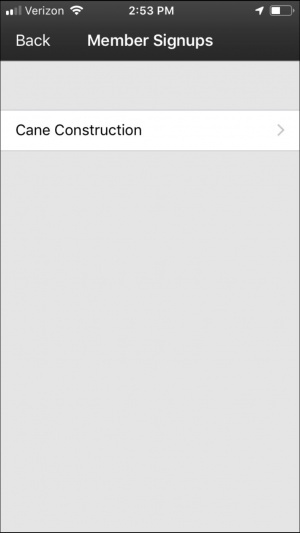 NOTE: The Premium version of the Staff App is required to log new notes using the Staff App. Click Here to learn how to upgrade to the Premium version, and start taking advantage of additional features. Click the in the header bar. Contact: If needed click the > to select a different contact. 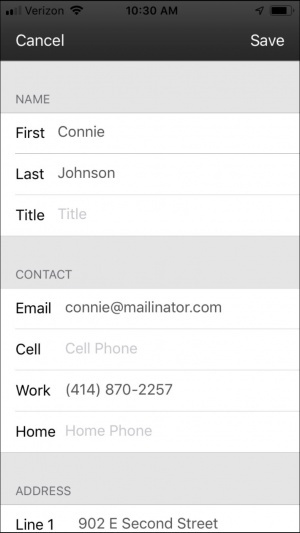 The contacts are displayed alphabetically. Task: If needed click the > to select a different tasks. Tasks are communications categories. Subject: Enter the subject for this note (required). Message: Enter details of the note (required). Follow Up Date: If you wish to include a follow-up for this note, click the > and select a follow up date. The note is now logged on the members communications tab. Is Primary. The slider will default to Green, indicating that this representative is the primary for the member. Slide the right to indicate that this rep is not the primary. NOTE: If the new rep is selected as primary, the member's existing primary rep will be changed. Click Directions to get directions to the location. NOTE: The App will use whichever mapping application you have installed on your device. Click the icon in the header. Select Use Camera to take a new picture. Take the photo and click Use Photo. The photo will be added to the member's profile. You may Retake the photo if needed. OR click Choose Existing to select a photo from the albums on your phone. 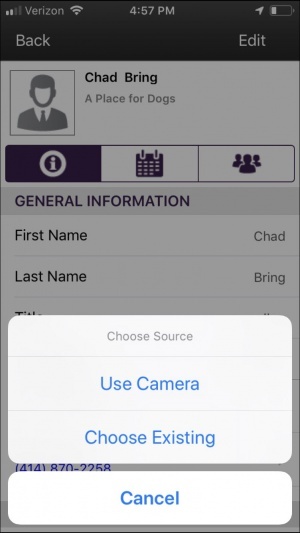 Using the Staff App, you will be able to view representatives associated to your members, update their contact information, call or email them, view the events they are registered for, and the groups that they belong to. Click the Reps tab. All Active representatives will be displayed in alphabetical order. Type the name of the rep in the search box, or scroll through the list to locate the desired representative. OR click the icon to filter result by Active, Inactive or both. Click the name of the desired representative. Click the name of the rep for whom you wish to add a profile photo. 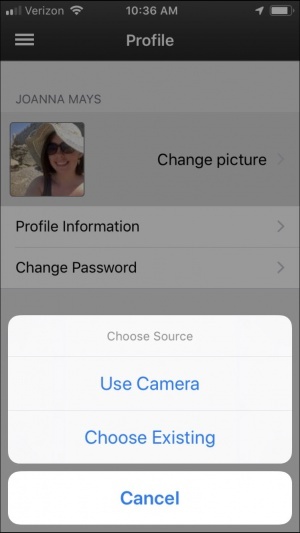 Choose Use Camera to take a photo, or click Choose Existing to choose a photo from the photos on your phone or ipad. Click the name of the rep that you wish to call. 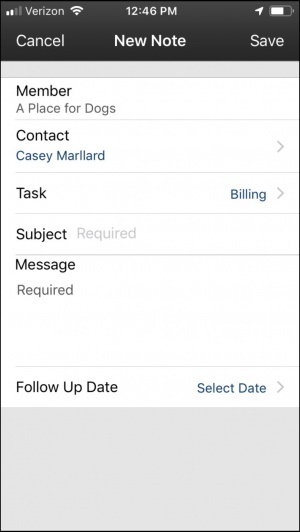 NOTE: The Premium version of the Staff App is required to send emails using the Staff App. Click Here to learn how to upgrade to the Premium version, and start taking advantage of additional features. Click the Reps tab, and click the desired rep. 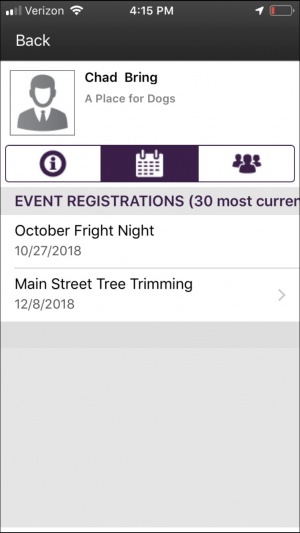 Using the Staff App, you can view the 30 most current event registrations for a rep. The events listed as the 30 most current registrations are any event registrations that are in the database for the current day forward and then any registrations with dates prior to today’s date until the list displays up to 30 events. This only displays those with a “Registered” status and is not looking at the “actual attendance” field. NOTE: this event list is specifically those that are associated with this particular rep. If an event registration is made using the member record (and the rep name is manually typed in on that registration) then that registration will not appear under the rep. The registration must have been made using the rep record or later associated with that rep. NOTE: The list of groups is read only, you are not able to add or remove the rep from a list using the Staff App. In the list of groups, click the > next to the name of the group you wish to view. A list of all of the reps associated to the group will be displayed. Click the > next to a rep to view details about that member. The list may be filtered to Show All, Active or In-Active reps by clicking Filter in the header bar. In the list of groups, click the > next to the name of the group to which you wish to add a rep(s). Click Add in the header bar. A list of representatives will be displayed. Click the name of the representative you wish to add to the group. The rep will be added to the group. To add additional reps, repeat steps 4 - 5 above. 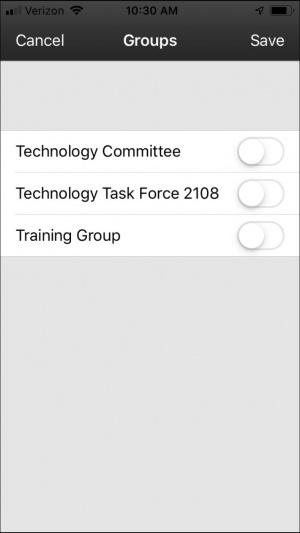 NOTE: Reps may be added to groups using the Staff App, but they may not be removed..
Click Events in the left-hand navigation. Time Frame: Select this option to choose Events This Week or Events This Month. 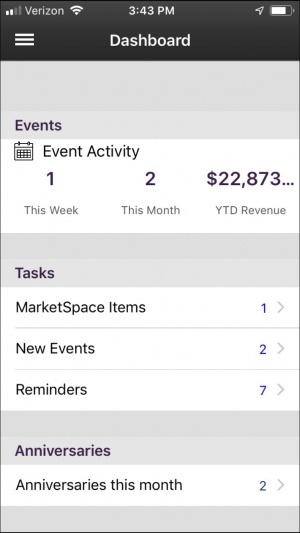 Category: Select this option to choose specific event categories. 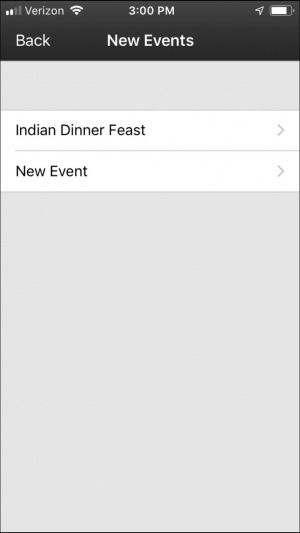 Featured: Select this option to filter events to just your Featured Events. Members Only: Select this option to filter to members only events. Click the > to view the details of an event. The dark bar on the left side of the event indicates this event is marked with Members Only visibility. When the event is entirely shaded, the event has been marked as a Featured event. 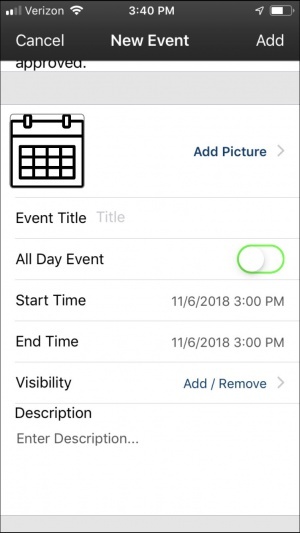 These visibility choices are selected on the event in the back office software on the event's General tab in the Placement Options section. 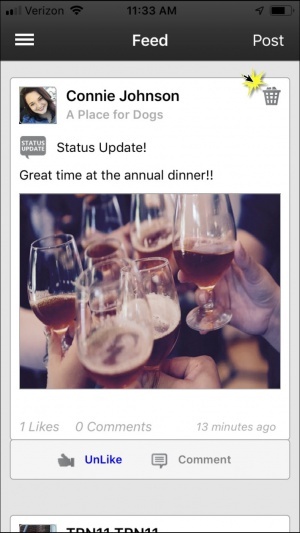 Quickly post an event on behalf of one of your members using the Staff App. 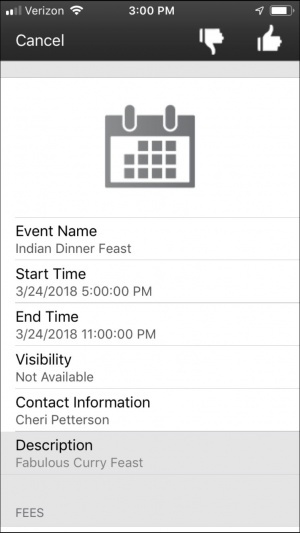 Events added via the Staff App are automatically approved. NOTE: You can then enhance it with additional photos, fees, etc. from the back-office. Add Picture: Click the > to take a photo, or select from the existing photos on your device. Start Time/End Time: Enter start and end dates of the event or move the All Day Event slider to the right. Visibility: Click Add/Remove to select the calendars on which you wish to display this event. Description: Enter a description of the event. If Registrations fees are associated to the event, you will be sent to the event registration page. OR: If fees are not associated to the event, you will be able to simply choose an existing rep from your database or enter a new attendee. Select the desired rep from the list. Click Add in the header bar. The rep is now added to the attendee list. OR click New Registrant to enter registrant information and click Add. 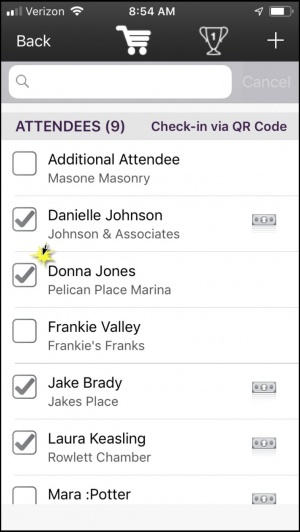 Using the Staff App you can easily check-in your attendees manually or by scanning the QR Code included in the event confirmation. 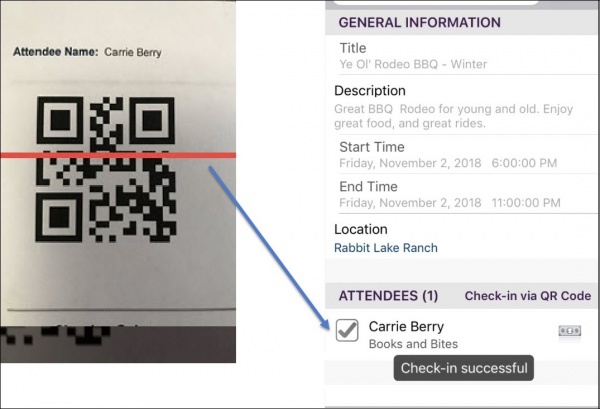 See Registration & Billing Preferences for instruction on including a QR Code in the event confirmation email. What is the benefit in checking in attendees? 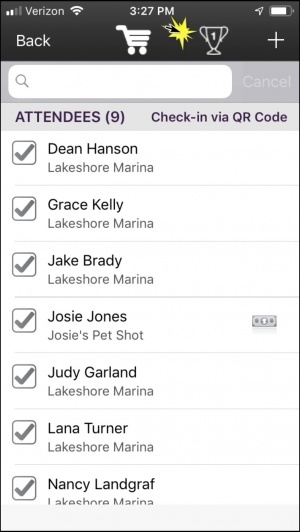 Check-in on the app will mark your guests as “actual attendees” in your back office software. 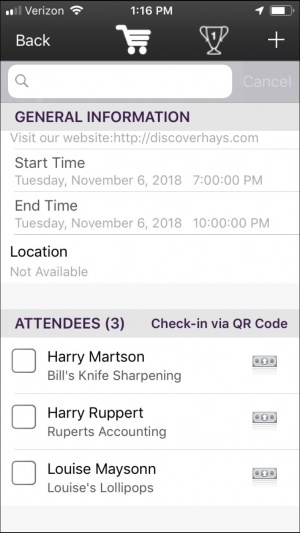 The selection “view/edit attendance list” on the Guest List tab is where you will see the attendees being marked off when listed as “Attending” on the app. 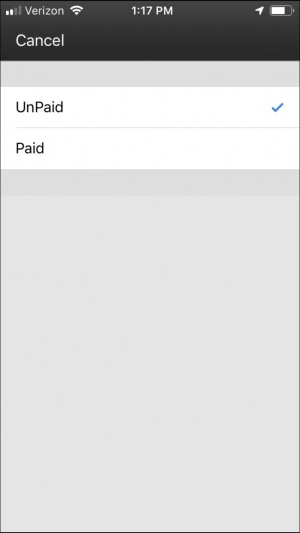 If using the Premium app, check-in will also give the ability to modify the payment type and record payments received which in turn create the appropriate transaction in your backoffice software. (Integrated Billing). Those with the CQI implementation will have transactions created as well, matching how it functions in the backoffice. NOTE: Check-in is available all day on the day of the event. 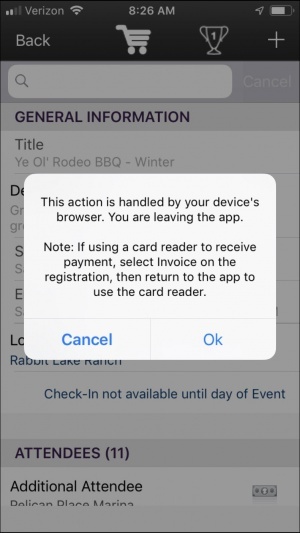 You may, however, accept payment any time prior to the day of the event using the app. In the Attendees section, click the check-box for the registrant(s) you wish to check-in. The attendee is now checked in, and the update is recorded in the database. 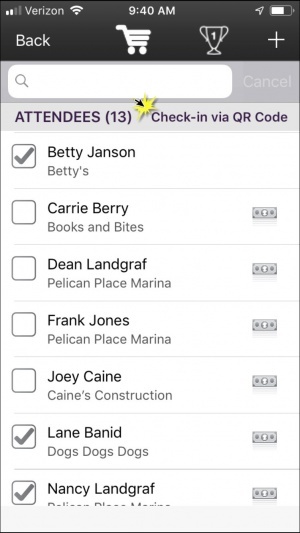 If you have included a QR Code in the event registration confirmation, you can easily check-in your attendees by scanning the code. See Registration & Billing Preferences for instruction on including a QR Code in the event confirmation email. NOTE: Check-in is available all day on the day of the event. In the Attendees section click Check-in via QR Code. Align the red-line displayed on your phone with the QR Code. The code will automatically be read, and if the attendee exists, the check-in will be successful. 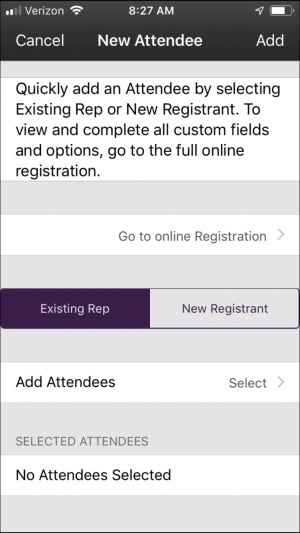 NOTE: The Premium version of the Staff App is required to mark attendees as paid with the Staff App. Click Here to learn how to upgrade to the Premium version, and start taking advantage of additional features. Attendees with unpaid registrations will display the icon. Click the icon for the attendee you wish to mark as paid. Pay with Card: Select this option if you wish to swipe a credit card, or manually enter a card. 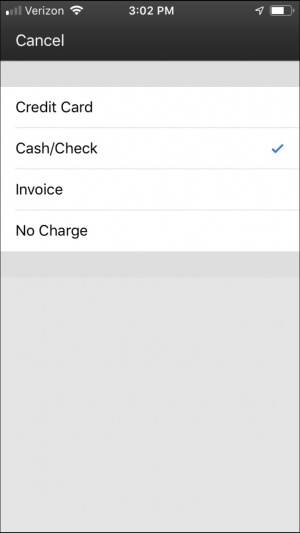 Payment Type: This option is editable only if an invoice has not already been created. Click the > to view payment options. For Example: If you are processing credit cards outside of ChamberMaster, you can select the Credit Card and mark this invoice as paid. (Optional) Click on Reference # if you wish to enter a check number, or indicate that the payment was made by cash or third party credit card processing. Credit Card: A Sales Receipt or invoice/payment is created based on the settings you have established for the event. If you are receiving credit card payment using the Pay with Card option, the Payment Type and Billing Status will automatically be set, and the reference number filled in. Cash: A Sales Receipt is created. Invoice: If an invoice has already been created, a payment is created and applied. If an invoice has not been created, an invoice and payment will be created. 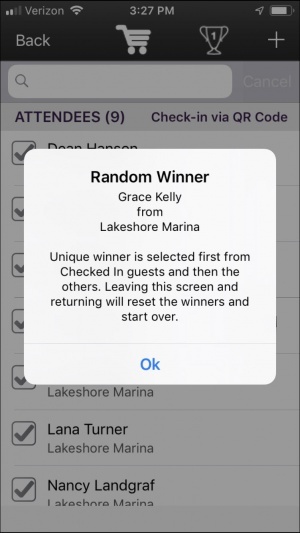 From your list of attendees, you can easily draw a random winner using the Staff App. NOTE: Premium Version of the Staff App is required to draw random winners using the Staff App. Click Here to learn how to upgrade to the Premium Version, and start taking advantage of additional features. Click the icon in the header bar. A random winner will be selected from those that you have checked in. 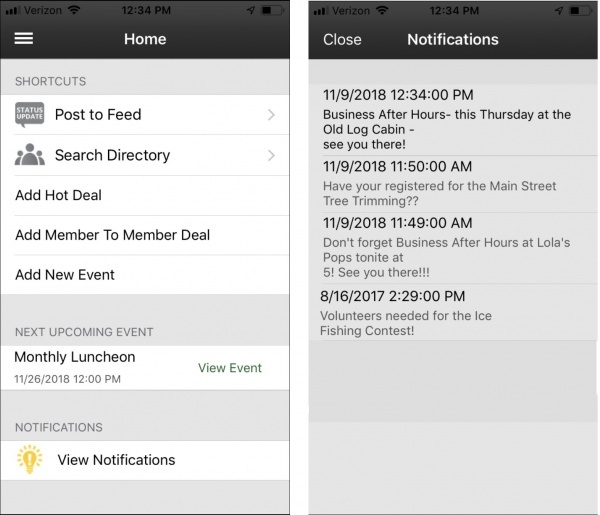 With the Staff App, you have the ability to view and approve Hot Deals, view and approve MarketSpace Items, view and approve membership applications, view and approve events submitted by your members, and view your reminders. NOTE: Job Postings and News Releases are not available for viewing/approving in the staff app at this time. 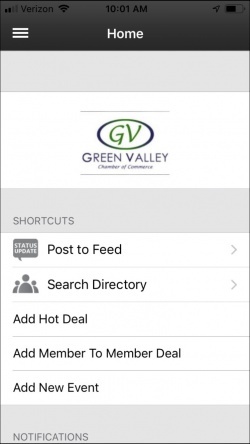 Hot Deals that your members have submitted via the MIC may be viewed and approved (or declined) using the Staff App. 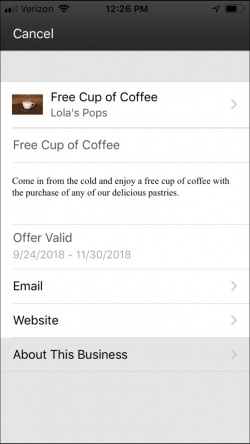 NOTE: Premium Version of the Staff App is required to approve Hot Deals with the Staff App. Click Here to learn how to upgrade to the Premium Version, and start taking advantage of additional features. In the Tasks section of the Dashboard, Hot Deals will be displayed with a number if there are deals requiring approval. Click the hot deal you wish to view and approve. Click to approve the Hot Deal, or click to reject the hot deal. MarketSpace Items that your members have submitted via the MIC may be viewed and approved (or declined) using the Staff App. NOTE: The Premium Version of the Staff App is required to approve MarketSpace items with the Staff App. Click Here to learn how to upgrade to the Premium Version, and start taking advantage of additional features. In the Tasks section of the Dashboard, MarketSpace Items will be displayed with a number if there are MarketSpace Items requiring approval. Click the MarketSpace Item you wish to view/approve. Click to approve the MarketSpace Item, or click to reject the MarketSpace Item. Membership Applications submitted on-line may be viewed and approved/declined using the Staff App. 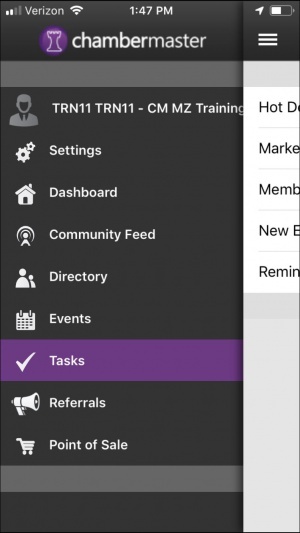 In the Tasks section of the Dashboard, Member Signups will be displayed with a number if there are membership applications requiring approval. Click to approve the application, or click to decline the application. 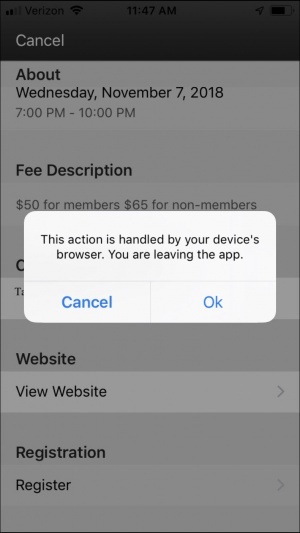 NOTE: Invoices/Receipts will not be created when approving a membership application using the Staff App. You will need to perform this task from the back-office. 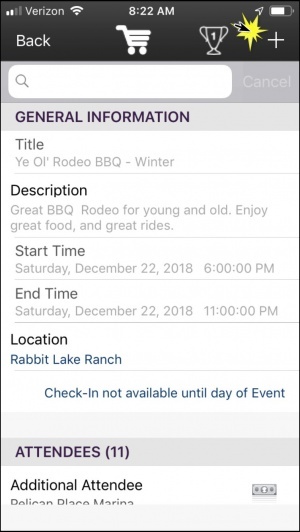 Events submitted by your members may be approved using the Staff App. 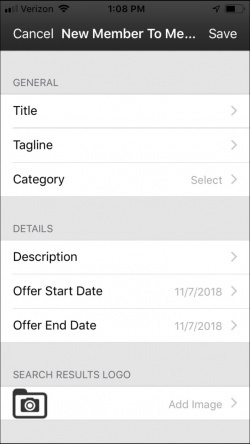 NOTE: The Premium version of the Staff App is required to approve events using the Staff App. Click Here to learn how to upgrade to the Premium version, and start taking advantage of additional features. In the Tasks section of the Dashboard, New Events will be displayed with a number if there are events requiring approval. 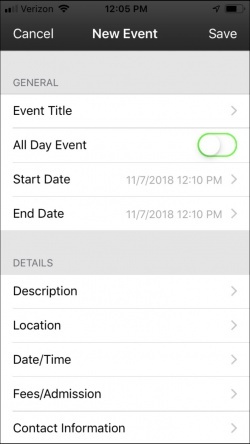 Click New Events. A listing of events needing approval will be displayed. Click on the name of the event you wish to view/approve. Click to approve the event, or click to decline the event. 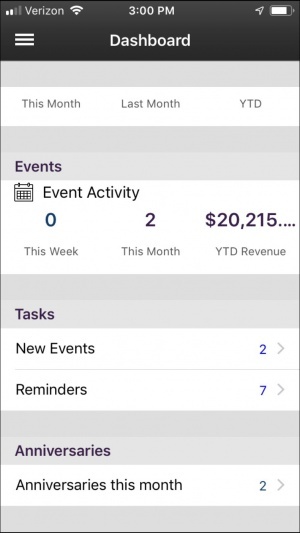 Reminders will be displayed on the Dashboard, allowing you to keep on top of tasks that you need to perform. NOTE: You can view reminders, however, to complete the reminders you will need to do that from the back office. In the Tasks section of the Dashboard, Reminders will be displayed with a number if you currently have reminders. Click Reminders to view the list of reminders. Click on the name of the desired reminder to view details. 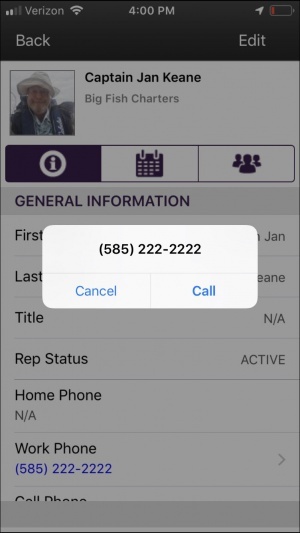 eReferrals allow you to provide your members' information to consumers when they ask for it. At the same time you can choose to send that consumer's information to your members giving them a lead. Every eReferral entered via the Staff App is recorded allowing you to show your members the value that you are giving them. 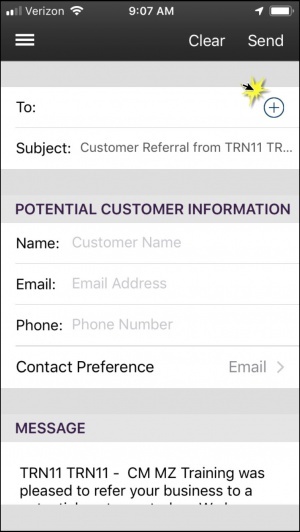 Each referral means you are pointing customers to their business. NOTE: The Premium version of the Staff App is required to send eReferrals using the Staff App. Click Here to learn how to upgrade to the Premium version, and start taking advantage of additional features. Click Referrals in the left-hand navigation panel. Click the icon in the To line to select which members you wish to send the referral to. You may select by Member, Rep or Category. Select desired recipients, and click Done. NOTE: After making your recipient selection(s), you can click View Recipients to view the list of recipients, and deselect any recipients you do not wish to included. Enter the Name of the potential customer. Enter the the Email of the potential customer. Enter the Phone number of the potential customer. 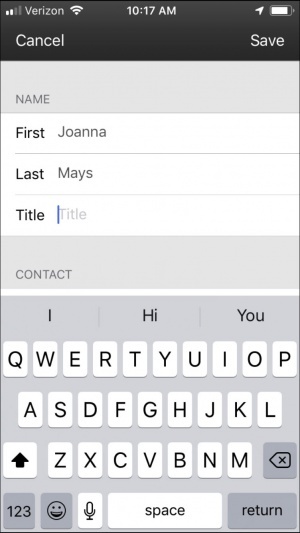 Select the Contact Preference. This will default to email. Click the > icon to change contact preference. Message: The default message you have configured in your database is displayed. Clicked into the message to add further details about the referral. The referral will be sent to the desired recipients, and will be logged on the member's communication tab. NOTE: GrowthZone Pay is required for use of the Point of Sale module. To learn more about GrowthZone Pay contact sales@growthzone.com. The the Staff App Point of Sale module provides a full feature check-out solution. If you wish to sell additional items at your events (raffle tickets, mulligans for golf tournaments, etc.) or you want to easily sell items in the office, this can be accomplished with the Staff App. No longer do you need to tie these items to an event registration or use the back office software to accept credit card payment on-site. Your staff will appreciate the automatic transactions created on the members' account - with no extra effort - it's immediate upon purchase. Used with the mobile card reader, this new Point of Sale module will provide quick checkout and a smooth, efficient customer experience. Click here to view a video of how it works. We recommend the follow readers, available for purchase at POSGuys.com. The IDTech Shuttle mobile card reader provides your iPhone and Android mobile device an excellent method for collecting payments. Compatibility with a wide variety of devices makes the Shuttle easy to setup and great for use with the Staff App. Connects via audio jack. Available for purchase at POSGuys.com. The ID TECH iMag Pro II is a magnetic stripe reader for all Apple Lightning connector devices: iPhones and iPads. IDMR-AL30133A - available for purchase at POSGuys.com. For iPhones without an Audio Jack. Only readers without manufacturer key-injection are compatible with GrowthZone/ChamberMaster Apps. Card readers are not specific to a mobile OS version but the apps are. Please ensure the app itself is compatible with your device before purchasing a card reader. The only setup required for using the Point of Sale module is configuration of Fee Items of type Point of Sale. 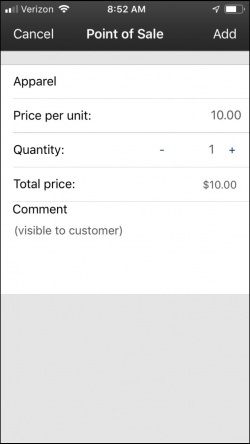 Once fee items are created they will automatically be available in the Staff App for sale. See Working with Fee Items for instruction on setting up your Point of Sales Fee Items. 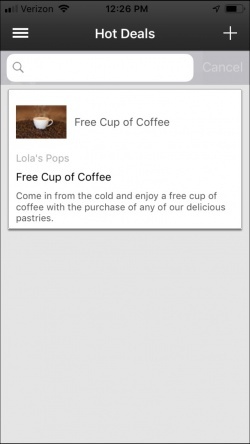 Click Point of Sale in the left-hand navigation of the staff app. Click the name of the item(s) you wish to sell. Enter the Quantity if needed. Click additional items OR click Continue to check out. 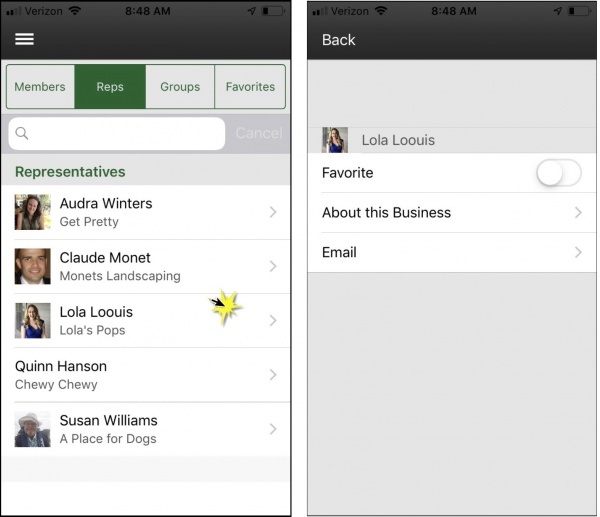 Click the Existing Member tab or the Existing Rep' tab and select the appropriate member or rep. A list of your members or reps will be displayed. Choose the appropriate member/rep, and click Continue. OR click Continue to checkout as a guest. Swipe the credit card (if using the Mobile Reader) OR click Manual Entry and enter credit card details. An appropriate invoice & payment or sales receipt will be created on the member or guest account. 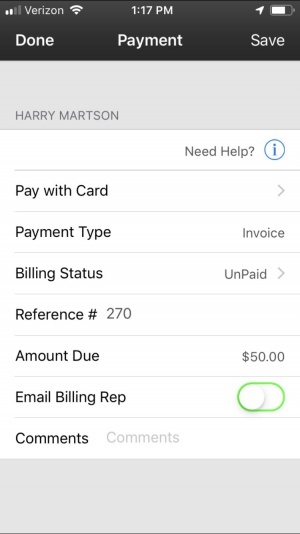 The transaction created (invoice/payment or sales receipt) is determined by the setting under Setup->Billing Options and Settings in the Credit Card section. NOTE: You can also access the Point of Sales functions from an event, by clicking the on the main page of the event. 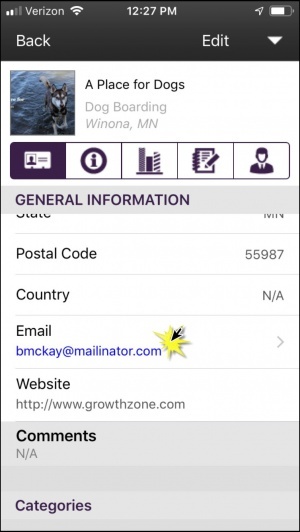 A free mobile app is available to all members of associations that use ChamberMaster or GrowthZone software. Click Here to view an online feature sheet for MemberPlus. 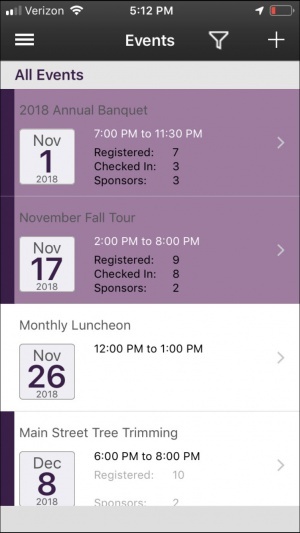 As you roll it out to members, we suggest adding the direct links to the MemberPlus app download pages in the iTunes app store and Google Play store. It does require that the member have a rep login to access it so you might want to send out an email with their rep logins merged in – just in case they forgot it. Which is exactly why this is so cool, once they download it, they can click the “remember me” option and it’s so much easier to use than going out to a website and trying to remember logins. 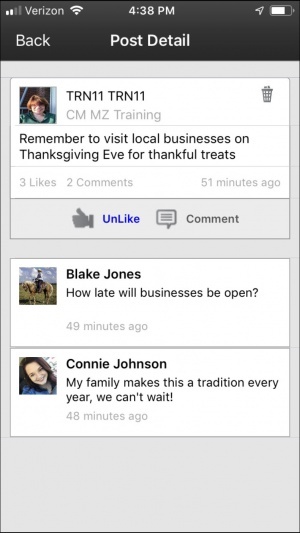 Have your staff and board members download it right away and make some posts in the social feed so as soon as members log in, they already see activity and can “like” or add posts of their own. Perhaps have your staff post a question so that members have something to respond to easily. Sometimes it just takes an easy example to get them started. There’s an icon in the upper right corner of your database called “MIC”. You can click on that to login with staff level access. You’ll be able to add posts and as staff, there’s a delete post option icon next to each post, should you ever need to remove a post that was made in error. NOTE: Your Reps must have log-in credentials to the Member Information Center (MIC) in order to log into the MemberPlus App. 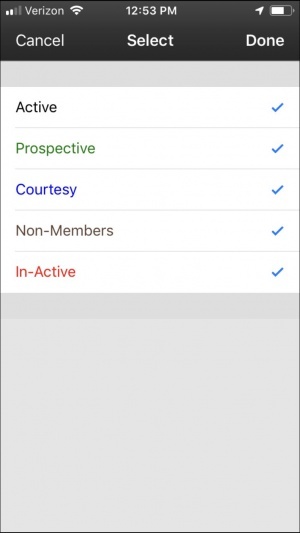 Access to the MemberPlus App functions are driven by the permissions that the member has to the MIC. See Set Rep Login Permissions for further details. Click the MemberPlus App icon on your device. 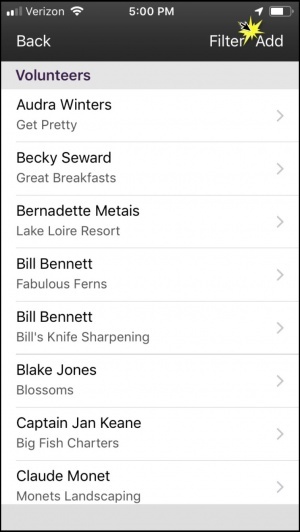 SHORTCUTS: In this section, members can easily add posts to your community feed, search the member directory, add hot deals, member to member deals, and events. NEXT UPCOMING EVENT: This section will display the next upcoming event, and provides a View Event link so your members can easily view further details about the event. NOTIFICATIONS: If you have sent notifications from the back-office, your member will be able to easily view notification, and past notifications. Home: Displays the home page described above. Community Feed: Displays the community feed and allows members to like posts, comment on posts and add posts. Business Directory: Displays the directory, and allows members to search the directory. 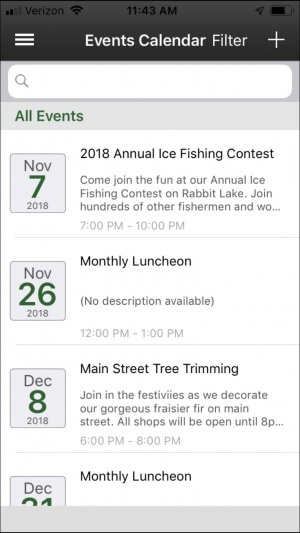 Events Calendar: Displays a list of all upcoming events, and allows members to view details of the events as well as register for events. Hot Deals: Displays a list of current hot deals, and allows members to add hot deals. Member to Member Deals: Displays a list of member to member deals, and allows members to add hot deals. Job Search: Displays a list of current job postings. News: Displays a list of current news releases. Resources: Allows the member to access the MIC Resources. Member Info Center: Logs the member into the MIC. 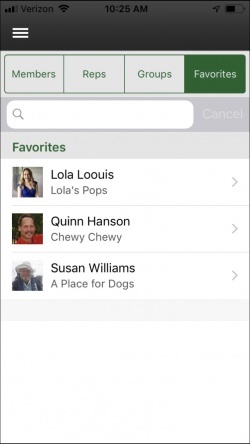 Where Phone is displayed in the app (i.e. Members, Reps, Job Postings, etc. ), clicking on Phone will allow you to place a phone call. 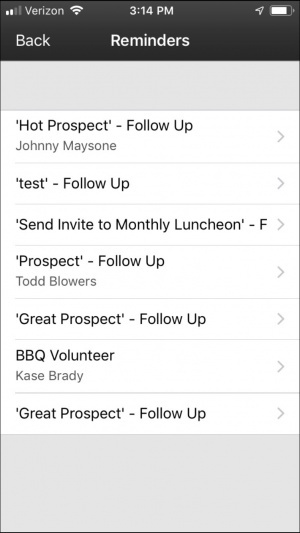 Where Email is displayed in the app (i.e. Members, Reps, Job Postings, etc. 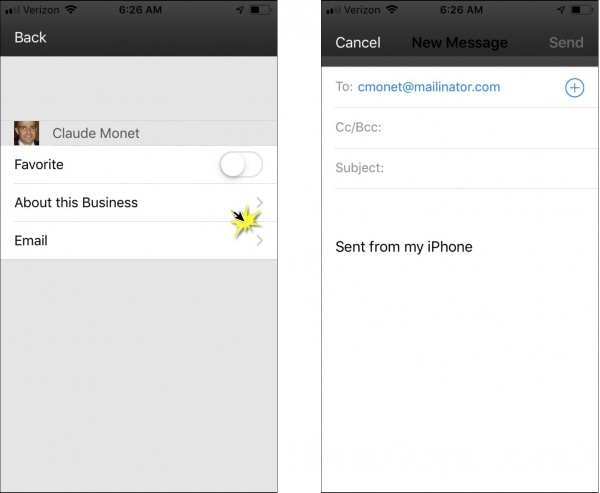 ), clicking on Email will allow you to send an email. 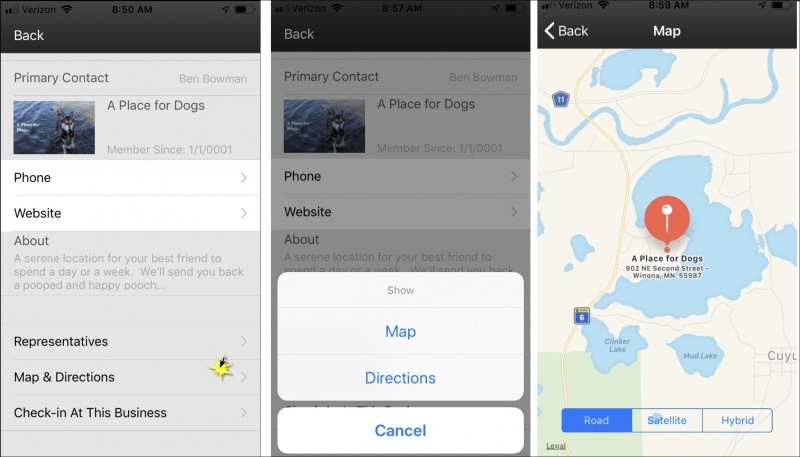 Where Maps & Directions is displayed in the app (i.e. Members), clicking on Map & Direction will allow you to view a map of the location and/or get directions to the location. 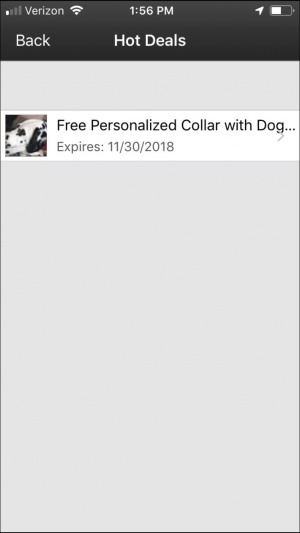 Where About This Business is displayed in the app (i.e. Hot Deals, Job Searches, etc. ), clicking About This Business will display the business's directory listing. 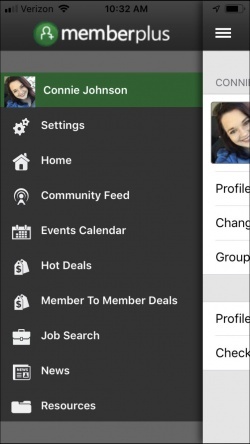 Your members can easily update their photo, profile information, and group participation using the MIC. Click the in the header, to display the navigation panel. Click your name. NOTE: If you have not already included a picture, when you access this page, you will be asked if you would like to add a profile picture. You may do so by following the steps below. Select Use Camera to take a picture, or Choose Existing to choose a photo from the photos on your device. 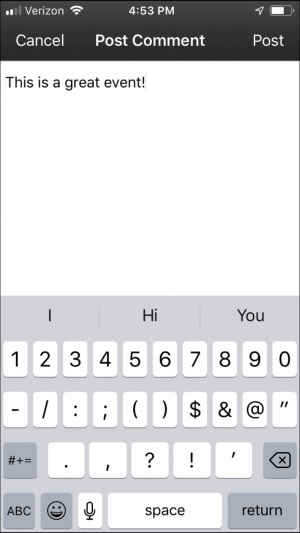 The new photo will be displayed in the App, as well as in the MIC. 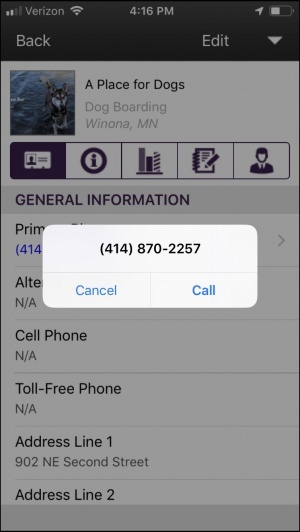 Using the MemberPlus App your members can easily update their contact and address information. Make changes by clicking into the desired areas. 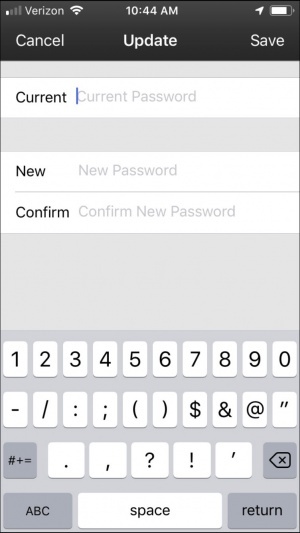 Re-enter the new password, to Confirm. 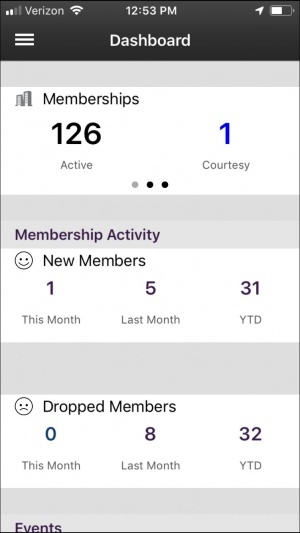 Members will be able to remove themselves from groups using the MemberPlus App. 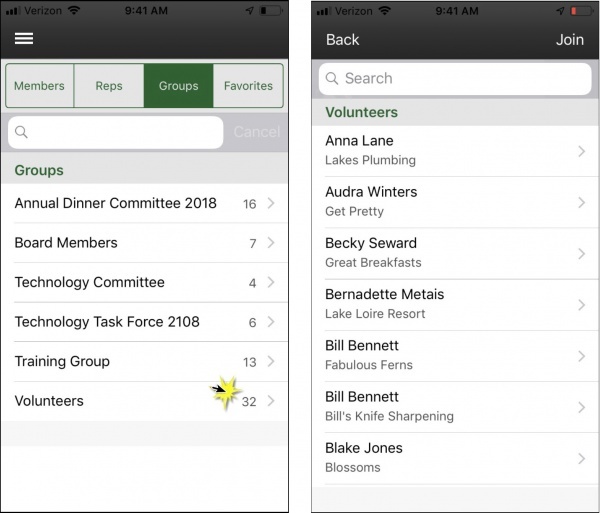 Additionally, groups that have been configured as Allow members to join/leave this group within the Member Information Center will be available to your members to join. Move the slider to the right for groups you wish to join, and move the slider to the left for groups you wish to be removed from. 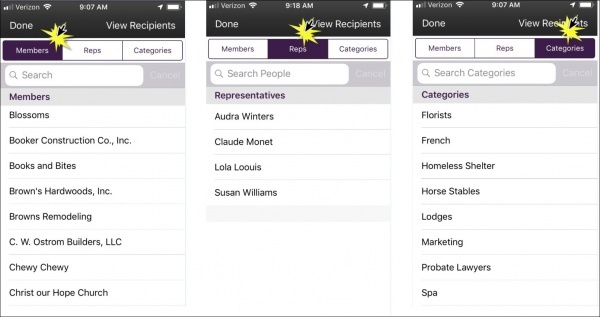 With the MemberPlus App, your members will be able to search the member directory, as well a search for reps, and groups. 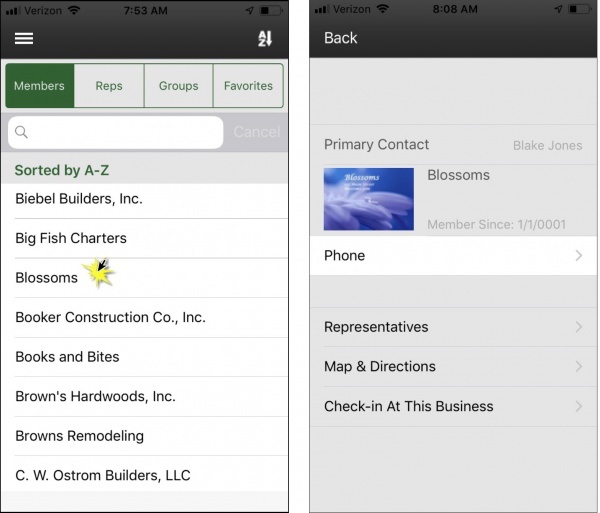 From the directory, members will be able to connect by getting directions, sending emails and making phone calls directly from the App. 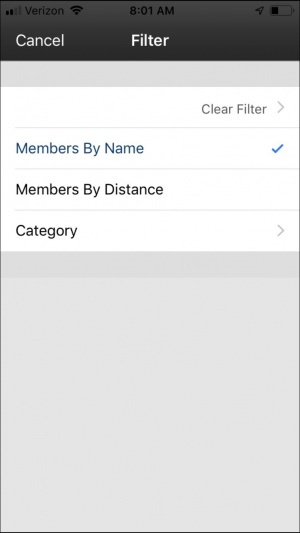 You can search for members by typing the name of the member in the search box, additionally, you can click the icon in the header bar to filter by member name, member distance (calculated from your current location), or category. From the member's directory listing, you can call the member, email the member, get directions, etc. See Common MemberApp Plus Functions for details. 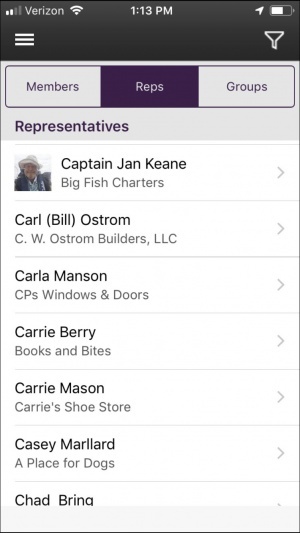 NOTE: Only representatives where Display Preferences for the Member Information Center (MIC) have been enabled will be displayed in the MemberPlus App. See Set Display Preferences for a Rep for details. 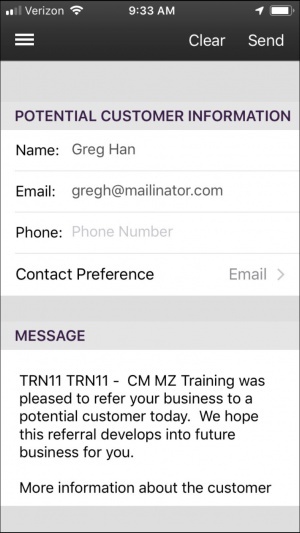 Click on the name of the desired rep.
From the representative information, you can call and/or email the representative (Only the options that are enabled under the reps Display Preferences will be available) and see further details of a reps business. 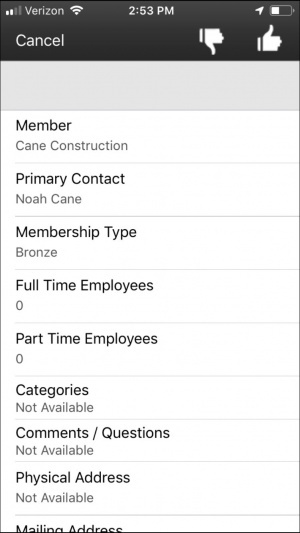 See Common MemberApp Plus Functions for details. 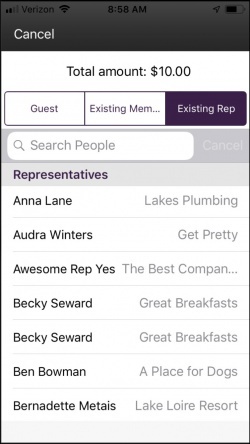 Members can mark representatives as favorites, to make it easy for them to find the reps in the App in the future. Slide the Favorite slider to the right. When it is green, the rep has been marked as a favorite. 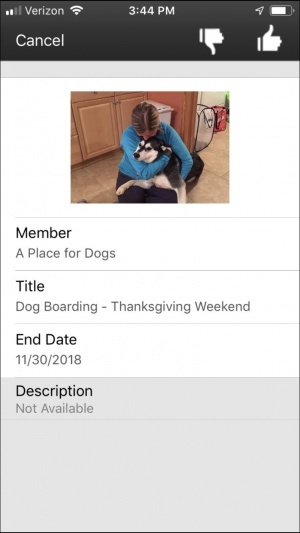 NOTE: Only groups that have been configured as Allow members to view/search this group in Member Information Center will be displayed in the MemberPlus App. See Create a Group for further information. Click the Groups tab. 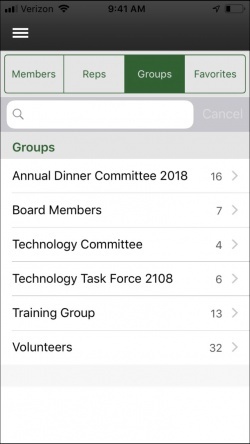 A list of all groups configured as Allow members to view/search this group in Member Information Center will be displayed. Click the desired group. A list of the reps in that groups will be displayed. 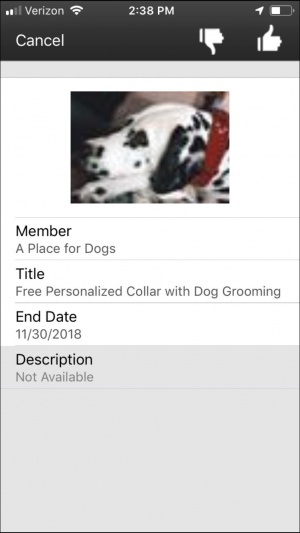 NOTE: Only groups that have been configured as Allow members to view/search this group in Member Information Center and Allow members to join/leave this group within the Member Information Center will be displayed in the MemberPlus App. See Create a Group for further information. Click Join in the header. The join option will only be displayed for those groups configured as Allow members to join/leave this group within the Member Information Center. See Create a Group for further information. NOTE: Representatives marked as favorites will be displayed on the favorites tab. 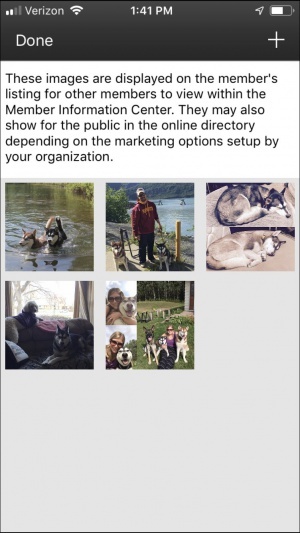 See Mark a Representative as a Favorite in the MemberPlus App. Click a Rep name to see further information. 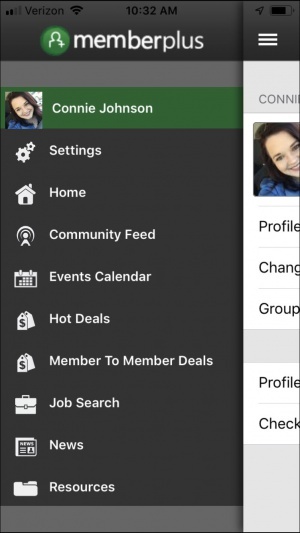 The Community Feed in the MemberPlus App displays the feed included in the Member Information Center. From the feed, your members will be able to view posts, comment & like posts, as well as add new posts. The Community Feed will display posts with the newest first. The name, and profile image (if available) of the person who added the post will be displayed. Posts may be "liked" by clicking the icon. Additionally, members may add comments to a post by clicking the icon. Click Post in the header. 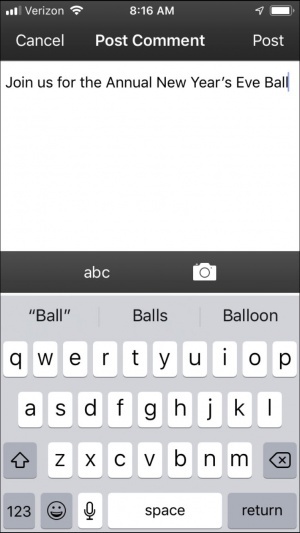 Enter your text, and/or click the icon to take a picture (or choose a picture from your device) to add to the post. Click Post in the header bar. Members may delete the posts that they have added to the feed. 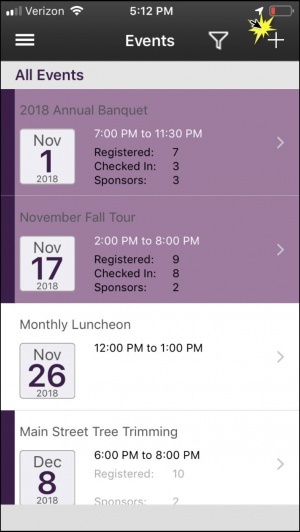 With the MemberPlus App, your members can view and register for upcoming events, as well as add events if they have permissions to do so. 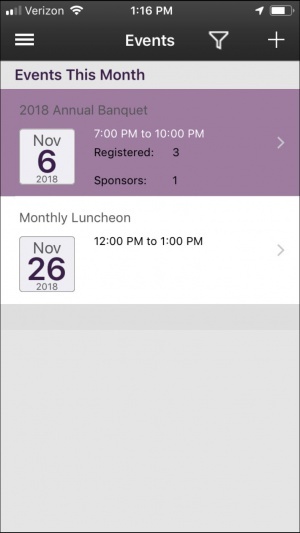 NOTE: Only events where visibility is set to Display on Member Information Center Calendar will be listed in the MemberPlus App. See Placement Options for further information. A list of future events will be displayed. You can search the events by entering the title of the event in the search box. This search option only searches by title (not description). Click the desired event in the list, to view details. NOTE: Registration via the MemberPlus App will only be available if the event is configured for Allow members to register online for this event. Scroll to the Registration section. By clicking register, the device's browser will be opened to display the event registration page. Complete the registration page, as you would if accessed on-line via your web-site or the MIC. 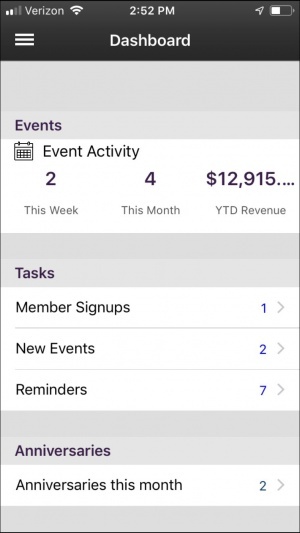 NOTE: The member must have Read/Write access to Events in the MIC in order to add events using the MemberPlus App. Events submitted via the MemberPlus App require staff approval. Enter the details of the event as desired. Click Save. The confirmation screen, shown below, will be displayed. You can approve (or decline) this event through the back-office. Click OK. The event has now been submitted for approval. 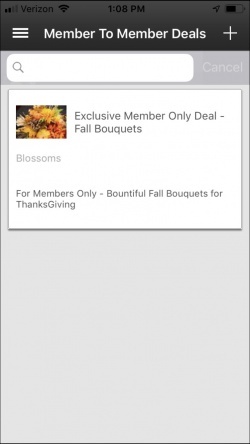 With the MemberPlus App, your members can view Hot Deals, as well as add Hot Deals if they have permission to do so. A list of all current Hot Deals is displayed. Click on a Hot Deal to see further details. 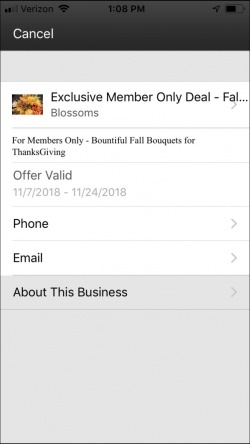 For the member offering the Hot Deal, you can click on Phone to call the member; click into Email to send the member an email; and click on About This Business to view the member's directory listing. NOTE: The member must have Read/Write access to Hot Deals in the MIC in order to add using the MemberPlus App. Hot Deals submitted via the MemberPlus App require staff approval. See Setup Member Log-in Permissions for further information. Enter the details of the Hot Deal. Click OK. The Hot Deal has been submitted for approval. 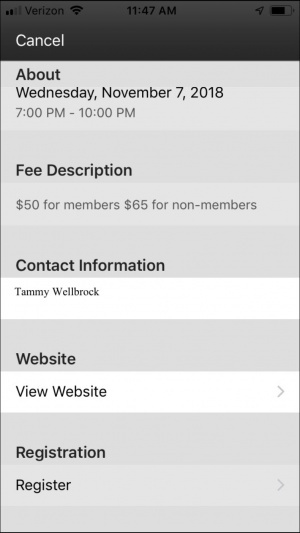 With the MemberPlus App, your members can view Member to Member Deals, as well as add Member to Member Deals if they have permission to do so. Click Member to Member Deals. A list of all current Member to Member Deals will be displayed. Click on a deal to see further details. You may place a call, send an email and see further information about the business. See Common MemberPlus App Functions for further information. NOTE: The member must have Read/Write access to Member to Member Deals in the MIC in order to add using the MemberPlus App. See Setup Member Log-in Permissions for further information. Enter details for the Member to Member Deal. Click OK. The Member to Member Deal has now been submitted for approval. 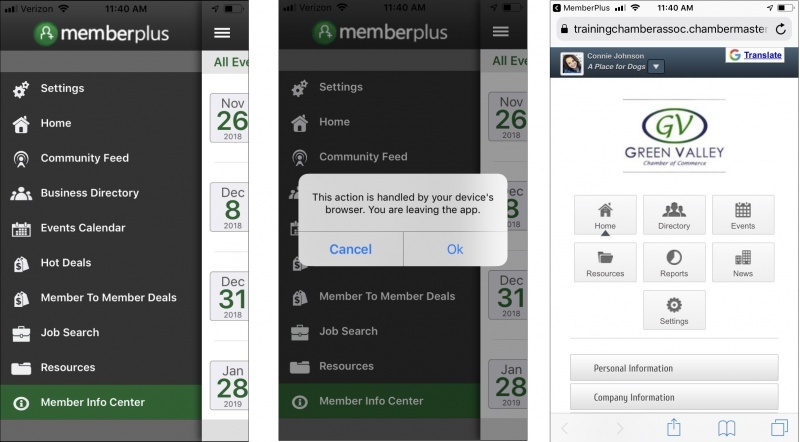 With the MemberPlus App, your members can view Job Postings in the MemberPlus App. Additionally, members can contact the company that posted a job by either sending an email or making a phone call. NOTE: At this time, Job Postings may not be added using the MemberPlus App. A list of all current Job Postings will be displayed. Click on a Job Posting to view further details. 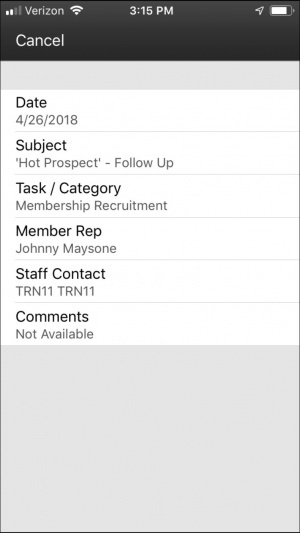 For the member offering the job, you can click into Phone > to call the member; click into Email > to send an email; and click into the member's name to view the business directory listing. 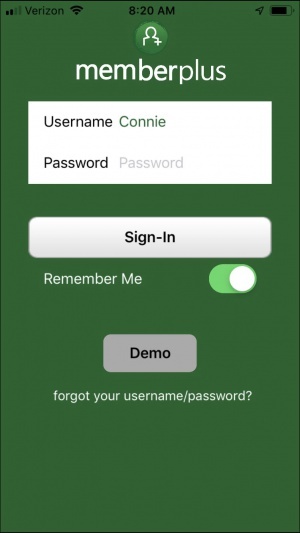 See Common MemberPlus App Functions for further information. 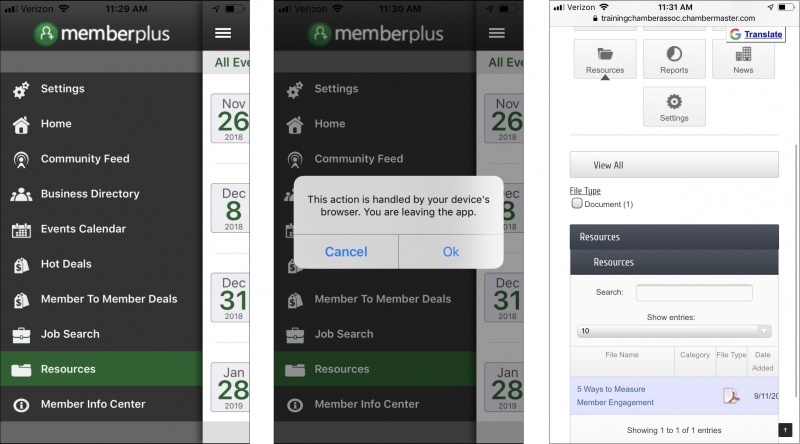 Using the MemberPlus App, Reps can easily access resources that have been uploaded to the Member Information Center. Resources are available in the MIC, and you must leave the MemberPlus App to access. Click OK. Your device will open the MIC on the resources page. From here you can view and download available resources. 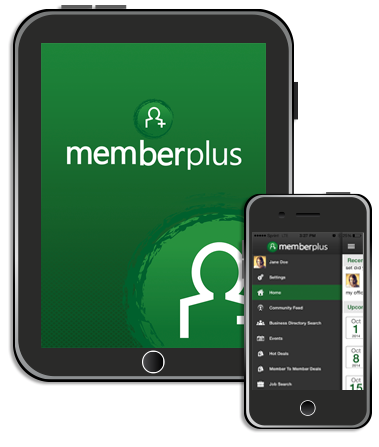 Using the MemberPlus App, Reps can easily access the Member Information Center. To access the MIC, you must leave the MemberPlus App to access. Click OK. Your device will open the MIC. 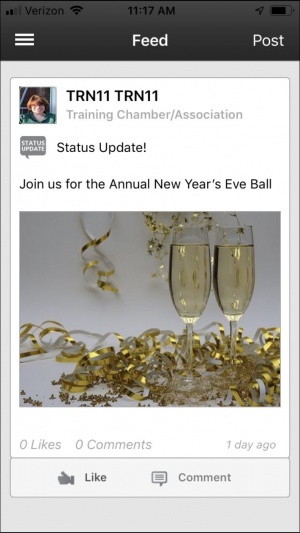 Push Notifications from your Chamber/Association are visible to your Reps via the MemberPlus App. 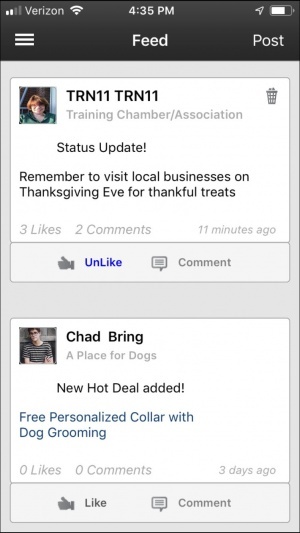 Push notifications are a fast and efficient way to communicate with your members. 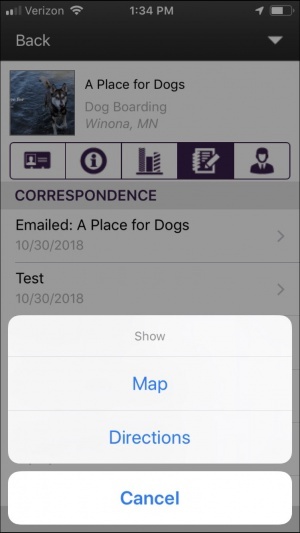 See Push Notifications for details on sending notifications to your reps. Select the app Home page. Click View Notifications in the NOTIFICATIONS section. NOTE: A yellow lightbulb indicates that there are new notifications. 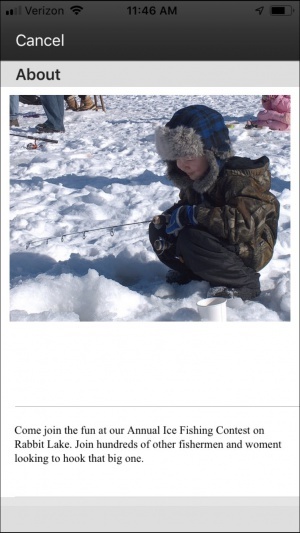 This page was last modified on 5 February 2019, at 07:15.